Please scroll down for Terms of Sale. Product is brand new & sealed. THIS IS FOR 2 SPEAKERS. 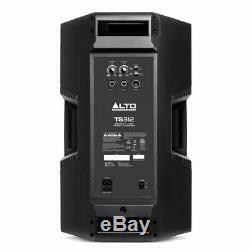 Alto Professional TS312 2000-Watt 12-Inch 2-Way Powered Loudspeaker. The new Alto Professional Truesonic TS3 Series does everything you demand in a no-compromise family of professional loudspeakers. These speakers solve every performance and installation challenge you have. They are high-performance in every sense: Their new transducers and amplifiers enable them to play extremely loud and clear, without compromise or restriction. And they are high-performance from a concept and manufacturing standpointwe made sure that every aspect of their design outperformed what it had to do. The end result are loudspeakers that achieve a level of excellence and refinement that defies expectations. 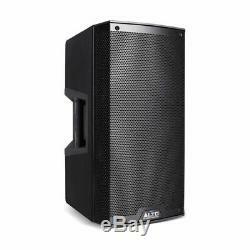 Alto Professional TS312 2000-Watt 12-Inch 2-Way Powered Loudspeaker Key Features. 2000 W peak (1300 LF + 700 HF) 1000 W continuous RMS (650 LF + 350 HF). 12-inch (305 mm) LF driver, 3-inch (76 mm) high-temperature voice coil. 1.4-inch (35 mm) neodymium magnet HF driver with precision wave guide. High quality, lightweight, cabinet design for easy transport, set up and installation. Pole-mountable, wedge monitor, bracket installation or flown application with integral M10 suspension points. Integrated 2-channel mixer with dual XLR 1/4-inch combo mic/line inputs, independent level controls, XLR Link output, Contour EQ switch and Ground-Lift switch. Custom-engineered high-efficiency class D amplifiers with passive cooling design no fan means the speaker runs cleaner, quieter and has greater long-term reliability. Design Origin: Designed and tuned in the USA. 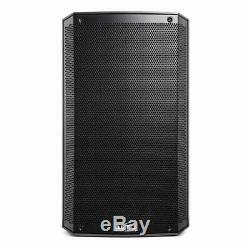 Alto Professional TS312 2000-Watt 12-Inch 2-Way Powered Loudspeaker Specifications. Output Power: 2000 W peak (1300 LF + 700 HF) 1000 W continuous RMS (650 LF + 350 HF). LF Driver: 12-inch (305 mm) LF driver, 3-inch (76 mm) high-temperature voice coil. HF Driver: 1.4-inch (35 mm) neodymium magnet HF driver with precision wave guide. Frequency Response: 53 Hz 20 kHz (+/- 3 dB). Frequency Range: 46 Hz 22 kHz (-10 dB). Horn Coverage: 90° H x 60° V nominal. Equalization: Contour Switch Low and High Frequency +3dB Boost. Connectors: (2) XLR/TRS 1/4 (6.35 mm) combo inputs, (1) XLR link output, (1) IEC power cable input. Controls: (2) Volume, Power on/off switch, Contour switch, Ground-Lift switch. Indicators: 2 x Power LED (front and rear), Clip limiter LED. Protection: Electronic clip, Thermal and transducer overdrive protection. Power Connection: IEC with Mains Fuse. AC Voltage Input: 100,110-120,220240 V, 50/60 Hz. Enclosure: Trapezoidal, injection-molded, polypropylene enclosure, with perforated steel grille. Mounting/Installation: 36 mm standard pole mount, Wall or ceiling mount using TSB125 bracket, Flown application with integral M10 suspension points, Wedge monitor. Dimensions: (H x W x D): 23.8 x 13.9 x 13.8 / 605mm x 354mm x 350mm. Net Weight: 35.9 lbs. States will be extra based on actual cost. 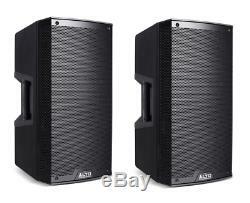 The item "Alto Professional TS312 2000-Watt 12-Inch 2-Way Powered Loudspeaker Pair of 2" is in sale since Thursday, February 28, 2019. This item is in the category "Musical Instruments & Gear\Pro Audio Equipment\Speakers & Monitors". The seller is "genesis-technologies" and is located in Austin, Texas. This item can be shipped to United States, Canada, United Kingdom, Denmark, Romania, Slovakia, Bulgaria, Czech republic, Finland, Hungary, Latvia, Lithuania, Malta, Estonia, Australia, Greece, Portugal, Cyprus, Slovenia, Japan, China, Sweden, South Korea, Indonesia, Taiwan, South africa, Thailand, Belgium, France, Hong Kong, Ireland, Netherlands, Poland, Spain, Italy, Germany, Austria, Bahamas, Israel, Mexico, New Zealand, Singapore, Switzerland, Norway, Saudi arabia, Ukraine, United arab emirates, Qatar, Kuwait, Bahrain, Croatia, Malaysia, Brazil, Chile, Colombia, Costa rica, Panama, Trinidad and tobago, Guatemala, Honduras, Jamaica, Viet nam, Uruguay.